After weeding all my subs down to nothing, I did some careful research while deciding what to subscribe to and what to pass on. I decided to give the blush mystery beauty box a shot, based on some really great reviews and unboxings! This was my first month of blush! The shipping was fast and I was really excited to get it! Blush is $25/month and includes at least $100 of products, which is a pretty great value. Here's what I got for September! 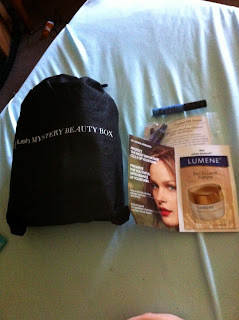 Aside from the bag itself, I got three little bonuses - a blush branded blue cream eyeshadow, a small sample of emu oil, and a sample of Lumene moisturizer. I'm happy to try all of the above! The shadow is a nice bright shimmery color. 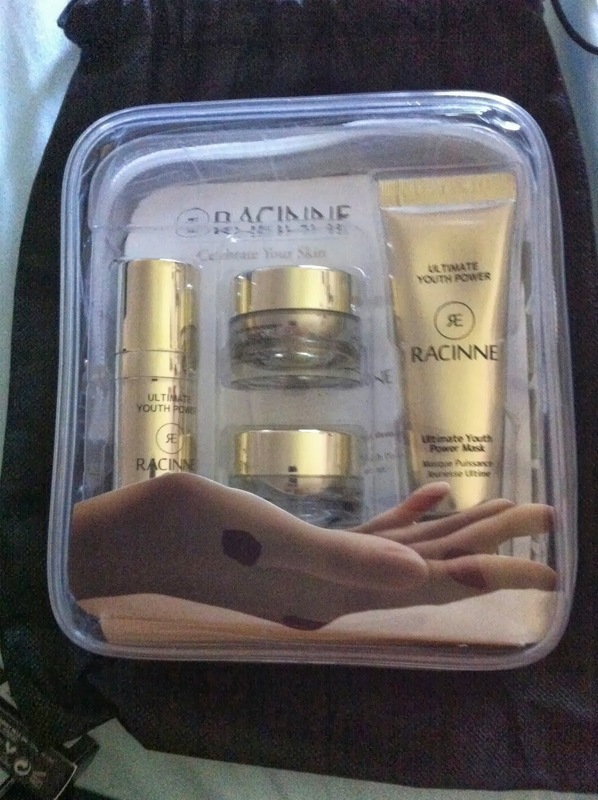 The biggest item this month is this Racinne Deluxe Travel Set. This is a 4 piece anti-aging skincare set! I've been using anti-aging products religiously over the last few years...despite still being in my 20s, prevention is easier than curing, so I'm happy to give this a shot and see what it does for me. I love the shiny gold packaging! 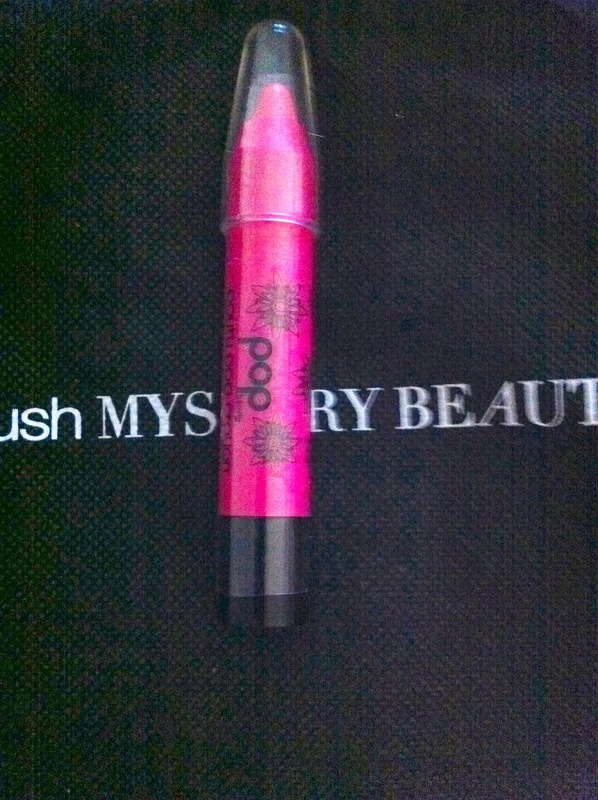 This is a pop beauty lip crayon in Fuchsia Flirt. 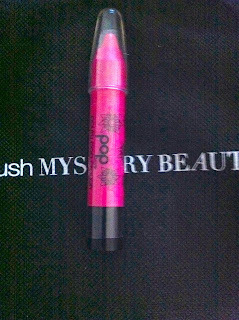 I actually have this same crayon already, so I gave this one away, but it is a nice product. It isn't really fuchsia..to me it's more of a bubblegum pink. It doubles as a cream blush. 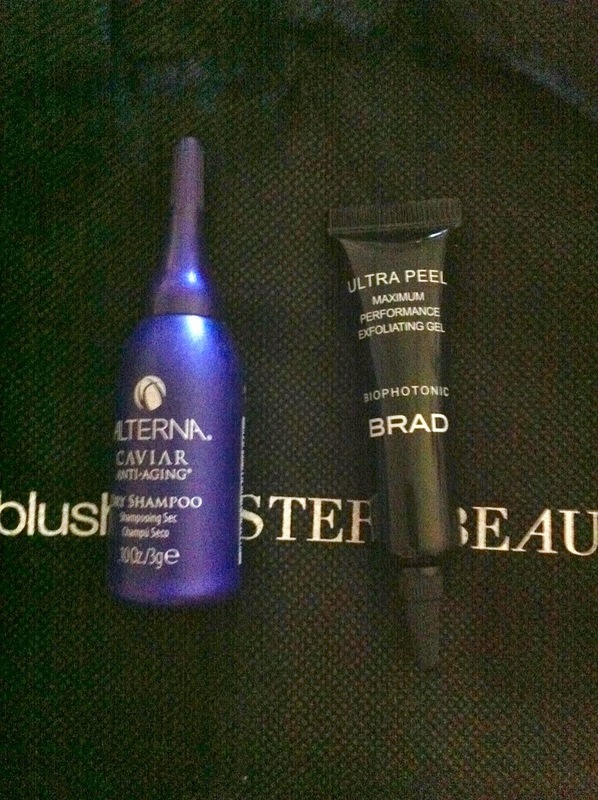 This first item is Caviar Anti-Aging dry shampoo by Alterna. 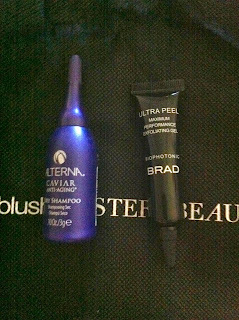 I love dry shampoos, and all of the alterna products I have tried have been really nice. I love the cute little bottle. 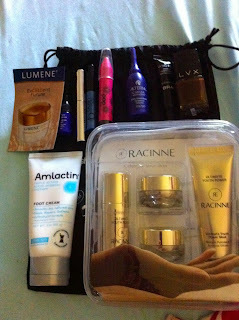 The 2nd item is Brad Biophotonic Skin Care Ultra Peel. It treats dark spots and evens the skintone. I haven't heard of this brand, but I love peels so this is a welcome addition to my box, as well! This is a product I have heard others rave about - brow gel by Anastasia! I have gotten brow gels before that have been too dark for my fairly blonde brows. I'm happy to get a clear one. 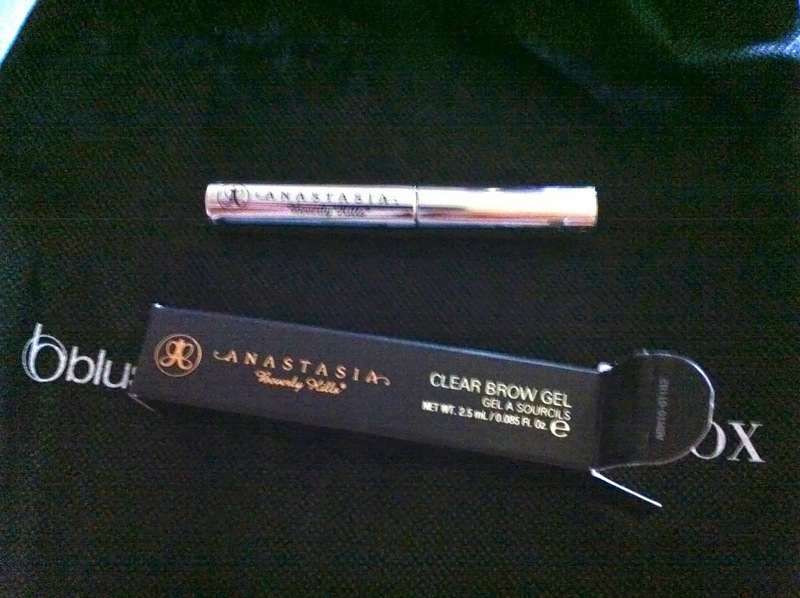 I don't do much with my brows so I like the idea of a clear gel to help me keep them in order. 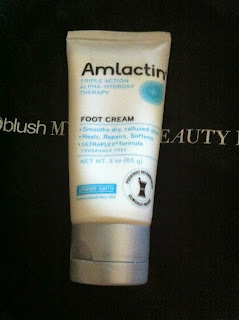 This is a foot cream by Amlactin. It doesn't have a scent to it, but it feels nice and moisturizing. 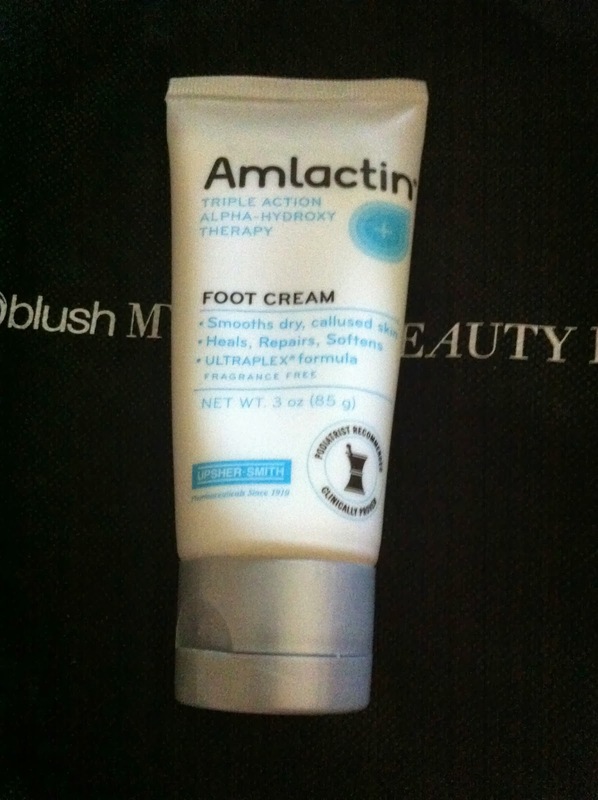 My skin gets dry in the fall and winter, so I'm always looking for creams to keep my hands and feet soft! I think this will be part of my bedtime ritual. 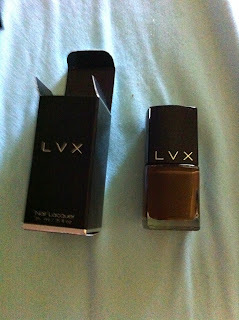 And finally, a nail polish by LVX. They sent out 6 different shades this month. I got Koko, which is a nice chocolate brown. I don't wear browns often, but I am glad to get this to branch out! It's a really pretty color for fall. I haven't tried this brand and I'm excited to. Overall, I am really happy with this box! 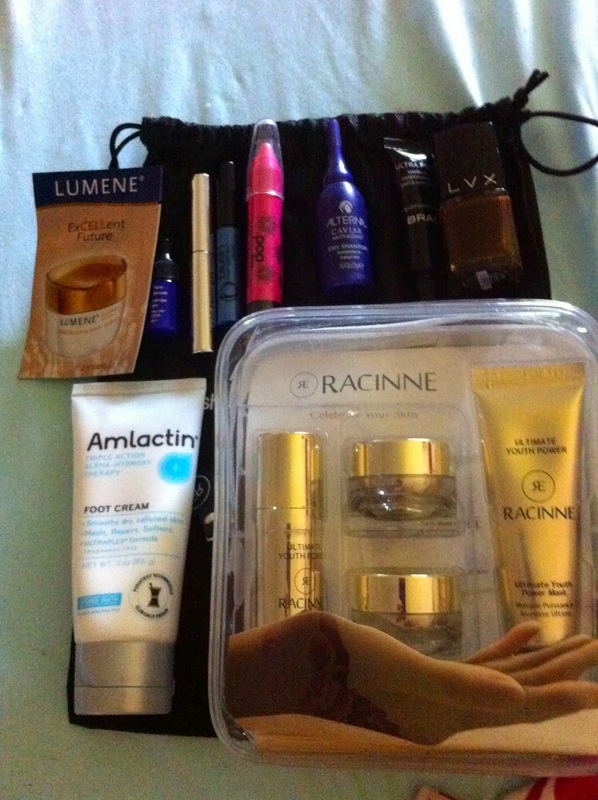 I love the variety of items - there's skincare, makeup, hair care, polish, and foot cream! This is definitely a fantastic value for what I paid, and I'm excited to see what comes in future boxes. Have you tried blush yet?